I recently re-organized my collection, an endeavour about which I'll have more to say at a later date. One of the things I came across during this task was the rather large amount of Western/Gold Key/Whitman comics I have. A large majority of them belong to my wife, who graciously allowed me to fold them into the collection (it must be love! 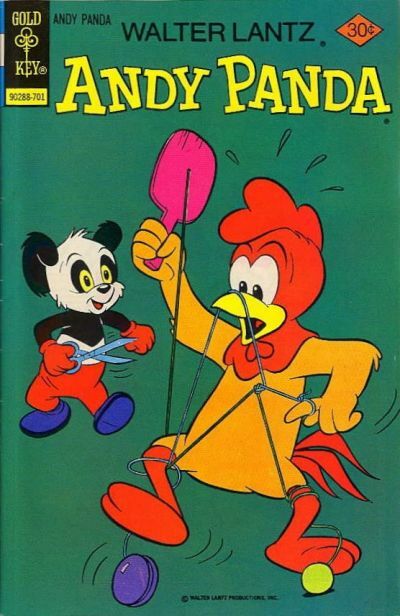 ), so reading them is doubly interesting, as I can imagine my wife as a child having read these very same comics. And before I wax Benjaminian on texts and memory, for me it is a connection to a version of her that I never knew, and that's kind of cool. The other realization I came to, however, is that I've never read any of them. I honestly can't think of one (okay, maybe one) that I've read. So I decided that once my Pride Month reads were over, I'd jump headfirst into some Western Publishing stuff and get an idea of what was going on there. They're a venerable publisher but I think were one that very much believed in the comics are for kids ethos of the medium. Maybe that's why I've never taken to them. But later this month we'll be reading some Howard the Duck, a series I consider to be the apotheosis of funny animal comics, and Western's a nice place to go to see some other articulations of that genre in action. Like today's comic. Andy Panda was fun and it's humour just intelligent enough to keep me entertained. It's definitely a children's comic, but not one that necessarily is interested in talking down to the kids. Andy and Charlie Chicken hatch schemes and thwart plots - they're more adventurers than they are comedic buffoons, a la Porky Pig, perhaps. I find the funny animal genre fascinating, in that the anthropomorphization of animals is a long-standing mythic tradition, and I wonder what it means when we start using them as stand-ins not for our deities, but for ourselves. I'm sure I'll keep pondering this over the rest of the month.